Definition at line 574 of file compat.h. Definition at line 579 of file compat.h. Referenced by NtQueryInformationThread(), SetThreadAffinityMask(), test_affinity(), and test_NtGetCurrentProcessorNumber(). Definition at line 1048 of file winternl.h. Definition at line 581 of file compat.h. Referenced by GetThreadPriority(), and NtQueryInformationThread(). Definition at line 1050 of file winternl.h. Definition at line 578 of file compat.h. Referenced by GetProcessIdOfThread(), GetThreadId(), and NtQueryInformationThread(). Definition at line 576 of file compat.h. Referenced by fetch_thread_info(), GetExitCodeThread(), and NtQueryInformationThread(). Definition at line 580 of file compat.h. Definition at line 1049 of file winternl.h. Definition at line 577 of file compat.h. 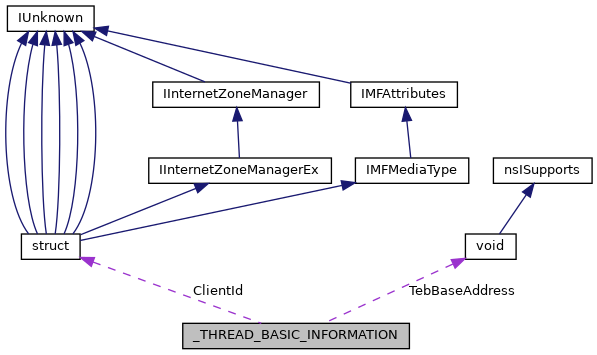 Referenced by CreateRemoteThread(), DbgUiConvertStateChangeStructure(), fetch_thread_info(), NtQueryInformationThread(), and RtlFreeUserThreadStack().